While my husband is utterly in love with the Dark Chocolate & Almond granola, I felt it was time to shake things up a bit and come up with a NEW favorite 😉 I happen to see this on Minimalist Baker (one of my favorite GF/vegan websites), and couldn’t wait to try it out! This granola comes together super fast and is DELICIOUS. It can easily be made Gluten free or vegan, and my only regret was in not making a double batch. Don’t be like me, learn from my mistake. 1. Pre-heat the oven to 320 degrees and have a large baking sheet ready. I line mine with parchment paper for easy clean-up, but it’s not necessary. 2. In a large mixing bowl, combine the first 4 ingredients and stir. 3. in a small pot over medium heat, combine the next 5 ingredients (or 4, if you are strictly using just 1 sweetner) and stir until well blended and the peanut butter is completely melted. 4. Pour the peanut butter mixture into the oats and mix well, making sure everytihing is as evenly coated as possible. 5. 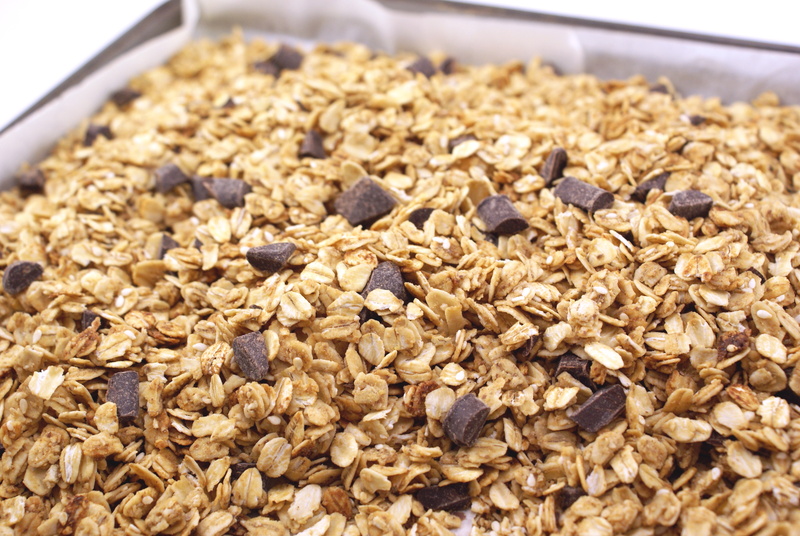 Then pour the granola onto your baking sheet, spread it out evenly, and bake for about 20-23 minutes until golden brown. Make sure to stir the granola about 10-12 minutes in, so that the oats near the edge of the pan don”t burn. 6. Allow it to cool completely before mixing in the chopped chocolate chips! The granola can then be stored in an air-tight container for up to 2 weeks, or placed in the freezer if you need it longer then that. mmm, this looks yummy! I love making granola! thanks for the recipe!